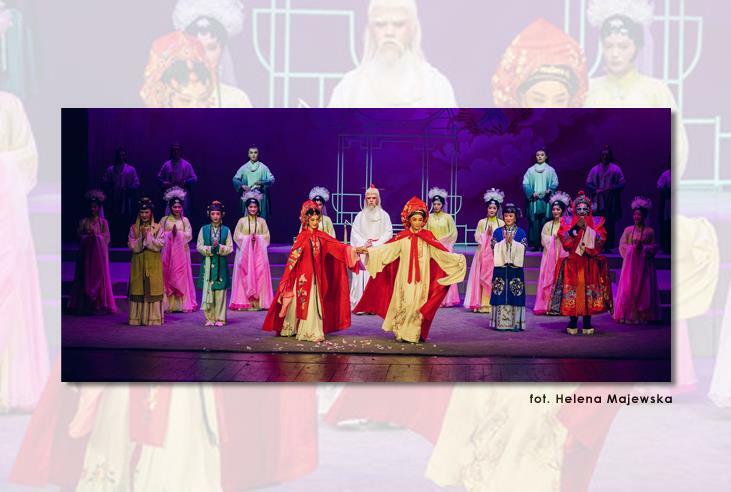 The vivid spectacle of the Chinese Yue opera, performed for the first time in Poland, left audiences in awe. All three shows (16, 20 and 21 of January) were sold out. After the event, viewers commented that it was a truly exotic experience. The conventional, traditional love theme of the “The Peony Pavilion” was showcased with great mastery, both in terms of voice emission – not only in the parts sung, but also those recited – and choreography. The symbolic scenography served the purpose focusing on the actors, their performance, the complexity of their costumes and makeup. For the Polish viewer, it was equally interesting to see the male lead role of the scholar – Liu Mengmei – be played by a woman. Choosing female actors in male roles is characteristic of this opera genre and other features include elegant visual forms and subtle, soft vocals, which make it ideal for telling love stories. All this accompanied by a score performed entirely with traditional Chinese instruments. After the event, the performers were awarded with standing ovations. A special guest during the Warsaw performance was Chinese Ambassador in Poland, Mr. Liu Guangyuan. Photos from the performance in Teatr Polski in Warsaw, January 16 2019.